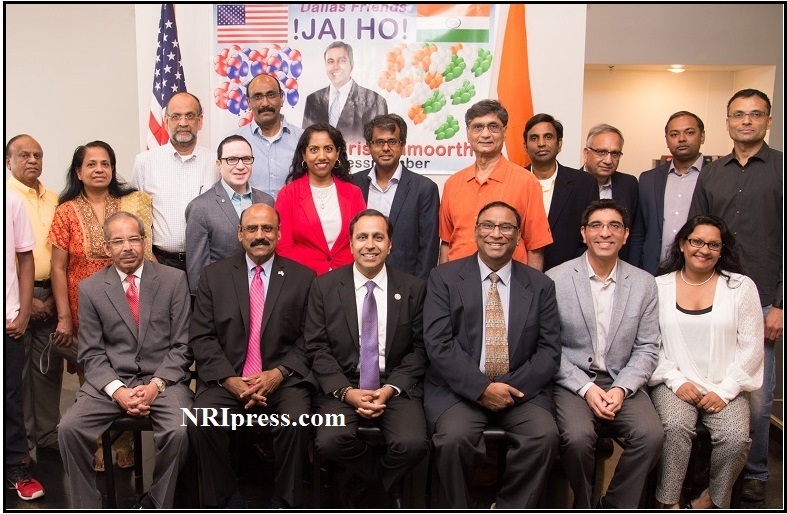 Dallas, TX: “Dallas Friends of Raja” hosted a grand victory celebrations to the Hon. US Congressmember Raja Krishnamoorthi on April 29, 2017 in Dallas (Touch Nine Restaurant). A prominent Indian American Leader and one of the main organizers of this event Dr. Prasad Thotakura while introducing Raja stated that he is a very responsible Congressmember who pays attention to the detail and takes every opportunity to standby a common man in the US Congress. His almost perfect attendance of 235 roll calls out of 236 shows that he is a very responsible Congressmember who takes his job very seriously. Raja Krishnamoorthi in his remarks expressed that in general Indian Americans have a lot of tolerance and patience. He afraid that sometimes this may translate into a weakness rather than the strength, hence he encouraged all to speak up and stand for their own rights when needed in the main stream. In Q & A session, Raja clarified and articulated his opinions on several issues very candidly. He encouraged everyone to visit US Capitol especially with kids to show them the temple of Democracy where the action begins. Raja voiced that it is very important for Indian Americans to actively participate in US mainstream political system. He requested everyone to give him feedback periodically on any concerned issues. Raja acknowledged that the “Friends of Dallas” played a crucial role in his victory by remarkable fundraisers and thanked for the same. “The Friends of Dallas” felicitated US Congressmember Raja Krishnamoorthi in the midst of thunderous applause. The jubilant celebrations started off by Raja cutting the “Jai Ho Raja Victory Cake”, Mr. MVL Prasad garlanding Raja, Mr. C.C. Theophine and Dr. Prasad Thotakura presenting the memento and shawl on behalf of all gathered guests. Mr. C.C. Theophine in his closing remarks appreciated all the supporters and conveyed special thanks to Honorable US Congressmember Raja Krishnamoorthi for taking his valuable time to visit Dallas despite his busy schedule to say Big Thanks to his Dallas Friends.